액정표시장치 및 배면조명부(백라이트)용 도광판의 제조방법에 관한 것으로서, 종래의 결점을 개선하고 광원의 휘도를 상승시키지 않고 휘도의 향상을 도모할 수 있는 액정표시장치 및 배면조명부용 도광판의 제조방법을 제공하기 위해, 액정셀, 이 액정셀의 배면에 배치된 도광판 및 이 도광판의 측면에 배치된 광원을 구비한 액정표시장치에 있어서, 도광판을 광원으로부터의 광의 입사면, 입사된 광을 액정셀에 대해서 출사시키는 광투과면 및 입사면으로부터의 광을 광투과면 방향으로 인도하는 여러개의 작은 볼록부 또는 작은 오목부로 이루어지는 반사사면을 갖도록 구성하였다. It relates to a method of manufacturing a light guide plate for a liquid crystal display and a back lighting unit (backlight), a method to improve the conventional drawbacks and production of a liquid crystal display device and a back one trillion people sitting portion guide plate capable of improving the brightness without increasing the luminance of the light source to provide a liquid crystal cell, the liquid crystal cell, the back surface of the light guide plate and a liquid crystal display device having a light source disposed on a side surface of the light guide plate disposed on the, plane of light incident from the light guide plate the light source, a liquid crystal cell to the incident light a light transmission was constructed surface and so as to have a reflecting surface made of the optical parts of the light transmitting side a number of small projections or small concave to guide in the direction from the entrance face to the exit with respect. 이러한 구성에 의해, 종래 다수의 부품, 즉 광원, 도광판, 확산시트, 프리즘시트, 반사시트 등으로 구성되어 있던 배면조명부의 부품점수를 삭감시킬 수 있고, 휘도의 향상, 부품가격과 조립공정수의 저감을 도모할 수 있다는 등의 효과가 있다. With this configuration, the prior art a number of parts, that is, it is possible to cut the rear illumination of the number of components that consists of a light source, a light guide plate, a diffusion sheet, a prism sheet, a reflective sheet or the like, improvement of the luminance, the number of parts cost and assembly process of the there is an effect such that the can be reduced. 본 발명은 액정표시장치 및 배면조명부(백라이트)용 도광판의 제조방법에 관한 것이다. The present invention relates to a method of manufacturing a light guide plate for a liquid crystal display and a back lighting unit (backlight). 근래 퍼스널 컴퓨터의 소형화가 추진되고, 랩톱형이라 불리우는 휴대가능한 기종이 널리 보급되고 있다. Recently the miniaturization of the personal computer is driven, the portable type called laptop type has been widely spread. 이 랩톱형에 있어서는 그 표시는 통상적으로 액정표시가 사용되고 있지만, 근래의 컬러표시화에 따라 액정표시판의 배후에 광원을 마련하고, 표시화면 전체를 뒤쪽에서 조명하도록 한 백라이트형의 표시장치가 보급되고 있다. In this laptop type the display is generally, but the liquid crystal display is used, depending on the color display screen in recent years provided a light source behind the liquid crystal panel, and the display screen of the backlight-type display of the total to be illuminated from the back of the device is advertised have. 이와 같은 표시장치의 백라이트로서의 광원은 휘도가 높고, 또한 휘도의 불균일이 없어 평면전체를 조명할 필요가 있다. The light source as a back light of such a display device has high luminance, there is also no unevenness in brightness is required to illuminate the entire plane. 휘도를 향상시키기 위해서는 광원의 휘도를 상승시키면 간단하지만, 랩톱형의 퍼스널컴퓨터 등에 있어서는 전지 등을 구동원으로 하고 있기 때문에 광원의 휘도를 상승시키는 것은 한계가 있으며 종래 유효한 방법이 없었다. In order to improve the luminance simple if raising the brightness of the light source, however, since the driving source, a battery, etc. In the back of a laptop type personal computer, and is not the limit of increasing the brightness of the light source was not conventionally available methods. 일본국 특허공개 공보 평성4-162002호, 일본국 특허공개 공보 평성6-67004호를 공지예로서 들 수 있다. The Japanese Patent Publication No. Heisei 4-162002 call, Japanese Patent Publication No. Heisei 6-67004 call can be given as a known example. 종래의 액정표시소자용 에지라이트방식의 조명장치로서는 제3도에 도시한 바와 같이 광원(1)로서 냉음극관이나 열음극관 등의 램프를 사용하고, 이것을 투과성재료로 이루어지는 도광판(2)의 끝면에 배치하고, 도광판(2)의 상면에 조명면의 휘도를 면전체에 걸쳐서 균일화하기 위한 광산란효과를 갖는 유백색의 합성수지로 이루어지는 확산시트(3)이 마련되어 있다. The end surface of the light guide plate 2 made as the lighting apparatus of edge light type for a conventional liquid crystal display device using a lamp such as a cold cathode tube or a heat cathode tube as the light source 1 as shown in FIG. 3, and this as a transmitting material layout, the light guide plate (2) is provided with a diffusing sheet 3 made of a synthetic resin having a translucent white with a light-scattering effect for uniform over the entire surface of the brightness of the illuminated plane of the upper surface. 또, 그의 상면에는 확산광을 어느 정도 집속해서 표시장치의 정면의 휘도를 향상시키기 위한 제1 프리즘시트(4) 및 제2 프리즘시트(5)가 배치되어 있다. Further, the first prism sheet 4 and the second prism sheet 5, its upper surface by converging diffused light to some extent to improve the front brightness of the display device is arranged. 제4도에 관산란층의 구조를 도시한다. 4 also shows the structure of tube scattering layer. 즉, 광산란층(6)은 도광판(2)의 이면에 산화티탄 등을 사용한 여러개의 광산란물질이 인쇄 등의 기법을 사용해서 형성되어 있다. That is, the light scattering layer (6) has a number of light-scattering material with the titanium oxide and the like on the back surface of the light guide plate 2 is formed by using a technique such as printing. 광원(1)로부터의 광강도는 광원에서 멀어짐에 따라 저하한다. Light intensity from the light source (1) is lowered in accordance with increasing distance from the light source. 따라서, 도광판(2)에 있어서의 광산란층(6)의 광산란물질의 면적은 광원(1)에서 멀어짐에 따라서 크게 되도록 형성되어 있다. Therefore, the area of ​​the light-scattering material of the light scattering layer 6 in the light guide plate 2 is formed so as to be larger according to increasing distance from the light source (1). 또, 제3도에 있어서 광산란층(6)의 하면에는 반사시트(8)이 배치되어 있다. Further, when the light scattering layer (6) according to claim 3 also has a reflecting sheet 8 is disposed. 또, 일본국 특허공개 공보 평성7-294745호와 같이 도광판 바닥면에 그레이팅홈을 형성해서 도광판에 입사한 광을 반사시키는 방식의 도광판이 제안되고 있다. Further, Japanese Laid the way of the light guide plate to the light guide plate by forming a grating groove on a bottom surface as in the Patent Publication No. Heisei 7-294745 call reflecting the light incident on the light guide plate has been proposed. 이상 기술한 바와 같이 종래의 조명장치에서는 광원(1)에서 출사된 광은 도광판(2)로 인도되고, 광산란층(6)의 광산란물질에 의해 산란되고, 그 산란광은 반사시트(8)에 의해 재차 도광판(2)에 입사되고, 그 후 확산시트(3), 2장의 프리즘시트(4), (5)를 통과해서 액정소자에 조사되는 구성으로 되어 있으며, 그 구성이 복잡하였다. Or more in the conventional illumination device as described light emitted from the light source 1 is led to the light guide plate (2), being scattered by the light scattering material in the light scattering layer (6), the scattered light by the reflection sheet 8 this again is incident on the light guide plate (2), that it then passes through the diffusion sheet 3, two prism sheets 4 and 5 and is configured to be irradiated to a liquid crystal element, and the configuration was complicated. 그리고, 도광판(2)의 상면에 확산시트(3)의 광흡수물질을 배치하고 있으므로 휘도의 불균일은 감소시킬 수 있지만, 액정소자 전체의 휘도가 저하한다는 결점이 있었다. And, because of non-uniform and position the light absorbing material of the diffusing sheet 3 on the upper surface of the light guide plate (2) is the luminance may be decreased, there was a drawback that the brightness of the entire liquid crystal device decreases. 이와 같은 구성의 경우, 휘도의 향상을 방해하고 있고, 따라서 휘도의 균일화와 휘도의 향상이라는 상반되는 과제를 해결하는 것은 불가능하다. In the case of this configuration, and to prevent the increase of the brightness, and therefore it is not possible to solve the contradictory problem of improving the brightness of the luminance uniform. 또, 그레이팅홈을 형성한 종래의 도광판의 경우에는 휘도의 향상은 도모할 수 있지만, 그레이팅홈에 의한 도광판의 출사광과 액정표시소자를 구성하는 부재 예를 들면 액정셀의 규칙적인 패턴이 간섭해서 므와레가 발생한다는 문제점이 있다. In the case of a conventional light guide plate to form the grating grooves improvement of luminance it can be achieved, but, for members example of configuring the light emitted to the liquid crystal display element of the light guide plate according to the grating grooves is a regular pattern of the liquid crystal cell by interference Rega has a problem that occurs with moire. 이것을 해결하기 위해서는 광을 확산시키기 위한 시트를 병용하지 않으면 안 된다는 결점이 있었다. In order to solve this problem was a defect that must not be used in combination with a sheet for diffusing light. 또, 종래의 도광판(2)는 광원(1)에 의해 열이 전파되므로 도광판(2)와 반사시트(8)의 열팽창계수의 차에 의해 반사시트(8)의 고정이 곤란하고 반사시트(8)과 도광판(2)의 이면의 거리가 진동, 열변형 등에 의해 변화하거나 반사시트(8)과 도광판(2) 사이에 먼지가 혼입되는 것에 의해 광이용효율이 변화하여 휘도불균일이 발생하기 쉽다는 문제점도 있었다. Further, conventional light guide plate (2) includes a light source (1) Since the heat is transmitted by the light guide plate 2 and the difficult and reflective sheet (8 fixing the reflective sheet (8) by a difference of coefficient of thermal expansion of the reflection sheet 8 ) and is the distance between the back surface of the light guide plate (2) vibration, thermal deformation or the like change, or by the light utilization efficiency change by which dust is mixed is liable to luminance non-uniformity occurs between the reflection sheet 8 and the light guide plate (2) by there was also a problem. 본 발명의 목적은 이와 같은 현상을 타개하기 위해 이루어진 것으로서, 종래의 결점을 개선하고 광원의 휘도를 상승시키지 않고 휘도의 향상을 도모할 수 있는 액정표시장치 및 배면조명부용 도광판의 제조방법을 제공하는 것이다. SUMMARY An object of the present invention has been made to overcome such a phenomenon, to improve the conventional drawbacks, and provides a liquid crystal display device and manufacturing method of the back one trillion people sitting portion guide plate capable of improving the brightness without increasing the luminance of the light source will be. 제1도는 본 발명의 액정표시장치에 사용되는 배면조명부의 사시도. First turning perspective view of the rear lighting unit is used in a liquid crystal display of the present invention. 제2도는 제1도의 도광판의 작은 볼록부를 도시한 사시도. The small convex portions perspective view of the light guide plate of FIG. 1 2 degrees. 제3도는 종래의 액정표시장치의 배면조명부를 도시한 사시도. The third turning a perspective view of the rear lighting unit of the conventional liquid crystal display device. 제4도는 제3도의 도광판의 이면에 형성된 광산란층, 광산란물질을 도시한 모식도. The fourth turning the conceptual view of a light-scattering layer, the light-scattering material formed on the back surface of the light guide plate 3 degrees. 제5도는 제1도의 도광판의 실시예에 있어서의 도광판내의 광선궤적을 설명하기 위한 도면. A fifth view illustrating a beam trajectory in a light guide plate according to the embodiment of the light guide plate 1 degree turn. 제6도는 제1도의 도광판의 실시예에 있어서의 도광판내의 광선궤적을 설명하기 위한 도면. A sixth diagram for explaining a beam trajectory in a light guide plate according to the embodiment of the light guide plate 1 degree turn. 제7도는 도광판 입사광 확장각과 작은 볼록부 반사광의 출사각의 관계를 도시한 도면. The light guide plate 7 to turn the incident light angle and expanded view showing the relationship between the emission angle of the small projections reflected light. 제8도는 도광판 입사광의 확장각과 작은 볼록부 반사광의 출사각의 관계를 도시한 도면. An eighth view showing the relationship between the emission angle of the light guide plate in the incident light angle and expand small projections to turn the reflection light. 제9도는 본 발명의 액정표시장치에 사용되는 배면조명부의 도광판의 다른 실시예의 사시도. Ninth turn perspective view of another embodiment of a back lighting unit of a light guide plate used for liquid crystal display of the present invention. 제10도는 제9도의 실시예의 도광판의 작은 볼록부의 단면도. The cross-section 10 to turn the small convex portion of an exemplary light guide plate of claim 9 degrees. 제11도는 제10도의 실시예의 도광판내의 광선궤적을 설명하기 위한 도면. Claim 11 degrees view illustrating a beam trajectory in an embodiment the light guide plate of claim 10 degrees. 제12도는 본 발명의 액정표시장치에 사용되는 배면조명부의 도광판의 다른 5개의 실시예의 사시도. 12th turn another five perspective view of an embodiment of a back lighting unit of a light guide plate used for liquid crystal display of the present invention. 제14도는 본 발명의 액정표시장치에 사용되는 배면조명부의 다른 실시예의 사시도. 14 degrees perspective view of another embodiment of a back lighting unit that is used for a liquid crystal display of the present invention. 제15도는 제14도의 실시예의 주요부 단면도. Fifteenth embodiment turns the main portion cross-sectional view the embodiment 14 degrees. 제16도는 제15도의 실시예의 도광판내의 광선궤적을 설명하기 위한 도면. Claim 16 degrees view illustrating a beam trajectory in an embodiment the light guide plate of claim 15 degrees. 제17도는 본 발명의 액정표시장치에 사용되는 배면조명부의 다른 4개의 실시예의 단면도. 17 to turn the back lighting unit four different embodiments of the cross-section used in the liquid crystal display of the present invention. 제18도는 본 발명의 액정표시장치에 사용되는 배면조명부의 도광판의 다른 실시예의 사시도. 18 degrees perspective view of another embodiment of a back lighting unit of a light guide plate used for liquid crystal display of the present invention. 제19도는 본 발명의 액정표시장치에 사용되는 배면조명부의 도광판의 다른 실시예의 사시도. 19 degrees perspective view of another embodiment of a back lighting unit of a light guide plate used for liquid crystal display of the present invention. 제20도는 제19도의 실시예의 도광판의 작은 오목부의 형상을 도시한 도면. 20 degrees view showing the shape of a small recess exemplary embodiment the light guide plate of claim 19 degrees. 제21도는 본 발명의 액정표시장치에사용되는 배면조명부의 3개의 실시예의 단면도. 21] A cross section view of the rear turn three exemplary lighting unit used in a liquid crystal display of the present invention. 제22도는 제21b도의 실시예의 도광판내의 광선궤적을 설명하기 위한 도면. 22 degrees view illustrating a beam trajectory in the first embodiment the light guide plate 21b degrees. 제23도는 본 발명의 도광판의 실시예의 도트의 배치를 도시한 도면. 23 illustrates the placement of dots in the embodiment of the present invention the light guide plate to turn. 제24도는 본 발명의 실시예에서 사용하는 프리즘시트의 단면도. Claim 24 degrees cross-sectional view of a prism sheet used in an embodiment of the present invention. 제25도는 프리즘시트를 사용하는 본 발명의 실시예의 도광판 주변의 단면도. A cross-sectional view of a light guide plate close to the embodiment of the present invention, using a 25 degrees prism sheet. 제26도는 제25도의 실시예의 효과를 도시한 휘도특성도. 26 a luminance characteristic shows a first embodiment 25 degrees turn effects FIG. 제27도는 본 발명의 도광판의 제조방법의 1실시예의 공정도. 27 degrees is also the first embodiment of the process of the production method of the present invention the light guide plate. 제28도는 본 발명의 도광판의 제조방법의 다른 실시예의 공정도. 28 to turn the other embodiment the process of the manufacturing method of the light guide plate of the present invention. 제29도 본 발명의 도광판의 제조방법의 또 다른 실시예의 공정도. Figure 29 is another embodiment of steps in a method for manufacturing a light guide plate of the present invention. 제30도는 본 발명의 액정표시장치의 모식적 단면도. Claim 30 degrees schematic cross-sectional view of a liquid crystal display of the present invention. 상기 목적을 달성하기 위해 본 발명의 액정표시장치는 도광판 입사면으로부터의 광을 투과면방향으로 소정의 각도로 광의 진행방향을 변환시키기 위한 여러개의 작은 볼록부 또는 작은 오목부로 이루어지는 반사사면을 형성한 도광판을 사용한다. The purpose of the liquid crystal display of the present invention to achieve a device to transmit the light from the entrance face the light guide plate face forming the reflective surface consisting of parts of a number of small projections or small recesses, for converting the light traveling direction at a predetermined angle in the direction use the light guide plate. 또, 필요에 따라서 그 하면에 작은 볼록부 또는 작은 오목부로 이루어지는 반사사면을 따라서 반사막을 형성하거나 또는 반사시트를 배치한다. In addition, it places the small convex portions or along the reflective surface consisting of small concave portion to form a reflective film or a reflective sheet on its lower, if necessary. 또, 반사시트를 사용하는 경우, 적절한 프리즘정각(頂角)을 가진 프리즘시트를 배치해서 광투과면에서 적절한 각도분포를 가진 조명광을 표시소자를 향해서 조사할 수 있도록 하였다. Further, in the case of using the reflection sheet, and so that by arranging a prism sheet having a proper prism apex angle (頂角) can be irradiated with illumination light having a proper angular distribution in terms of the light transmitting toward the display elements. 반사사면을 따라서 반사막을 형성하는 경우, 도광판의 광투과면에서 출사한 광속의 출사방향이 도광판면에 대해서 연직방향으로 휘도가 가장 높아지도록 반사사면의 단면형상을 결정한다. In the case of forming a reflective film along the reflective surface and determines the cross-sectional shape of the reflective surface is the emission direction of the light flux emitted from the light transmitting surface of the light guide plate so that the luminance becomes higher in the vertical direction with respect to the light guide plate side. 한편, 반사사면의 바닥면에 반사막을 형성하지 않는 경우에는 주로 전반사를 이용해서 광의 진행방향을 변환한다. On the other hand, when not forming a reflective film on the bottom surface of the reflection surface is to convert the light traveling direction by mainly using the total reflection. 도광판의 광투과면에서 출사한 광속방향이 도광판면에 대해서 광속의 중심이 연직에 대해서 경사방향으로 휘도가 가장 높아지도록 반사사면의 단면형상을 결정한다. The center of the light flux for the light beams emitted from the surface light transmitting direction in the light guide plate if the light guide plate to determine the cross-sectional shape of the reflecting surface so that the higher luminance in the oblique direction with respect to the vertical. 그리고, 이 경우에는 도광판의 광투과면상에 프리즘시트를 배치하는 것에 의해서 집속 중 가장 휘도가 높은 방향의 광이 액정표시소자면에 대해서 연직, 즉 사용자가 액정표시장치를 바라본 경우에 정면휘도가 가장 높아지도록 적절한 정각을 가진 프리즘시트를 배치한다. And, in this case, the front luminance most in the case of the highest luminance high during focusing by placing the prism sheet on the side of the light transmission of the light guide direction light seen a vertical, that is, the user and the liquid crystal display device for a liquid crystal display element surface Place the prism sheet with appropriate so sharp increases. 표1은 본 발명의 실시형태를 정리한 것으로서, 도트(반사사면)의 단면 경사각, 깊이 또는 높이, 평면형상, 크기, 도트의 배치, 도트의 밀도분포, 본 발명의 도광판에 불가결한 부자재를 도시하였다. Table 1 as a summary of the embodiment of the present invention, dot-sectional inclination angle of the (reflective surface), the depth or height, planar shape, size, arrangement of dots, the density distribution of the dot, shows an indispensable auxiliary to the light guide plate of the present invention It was. 본 발명의 실시형태에는 도광판의 이면에 반사막을 형성하는 경우와 형성하지 않는 경우가 있다. Embodiment of the present invention may or may not form in the case of forming a reflective film on the back surface of the light guide plate. 작은 볼록부 또는 작은 오목부로 이루어지는 도트의 단면경사각은 20~50°, 바람직하게는 35°±10°가 적정하다. Cross-sectional inclination angle of the dot portion formed small projections or small recess is a 20 ~ 50 °, preferably 35 ° ± 10 ° is appropriate. 특히, 반사막을 형성한 경우에는 35°±10°, 반사막을 형성하지 않는 경우에는 35°±15°가 적정하다. In particular, when forming a reflecting film in the case does not form a 35 ° ± 10 °, the reflective film, it is appropriate is 35 ° ± 15 °. 도트단면 경사각을 상기 범위로 규정하는 것은 도광판의 출사면으로부터의 광의 출사각도 분포를 적정화함과 동시에 필요이상의 경사에서 출사되는 광의 양을 억제해서 정면휘도를 향상시키기 위함이다. Defining a dot-sectional inclination angle in the above range, it is intended to suppress the amount of light emitted from the slope above need and at the same time optimization of the light output angle distribution from the exit surface of the light guide plate to improve the front luminance. 도트의 깊이 또는 높이는 2~40㎛가 적정하다. The depth or height of the dot 2 ~ 40㎛ titrate. 그 이유는 도트의 깊이 또는 높이가 40㎛보다 큰 경우, 광원인 냉음극관에 가까운 부분의 휘도가 너무 높이지게 되고 결과로서 휘도분포가 불균일하게 되는 것, 또 도광판을 형성할 때 플라스틱재료가 금형인 스탬퍼의 도트의 작은 볼록부 또는 작은 오목부에 충진하기 곤란하게 되어 원하는 도트형상을 형성하기 어렵게 되기 때문이다. The reason is that in case that the depth or height of the dot is larger than 40㎛, to the luminance of a portion close to the cold cathode tube light source becomes so high that the luminance distribution is non-uniform as a result, the plastic material when the mold again to form the light guide plate it is because it is difficult to fill the small projections or small recesses of the stamper dots difficult to form a desired dot shape. 한편, 도트의 깊이 또는 높이가 2㎛보다 작으면, 광의반사효율이 저하해서 원하는 휘도를 얻을 수 없게 된다. On the other hand, if the depth or height of the dot is smaller than 2㎛, the light reflection efficiency is impossible to achieve the desired luminance decrease. 도트의 평면형상 즉, 도광판을 정면에서 바라본 경우의 형상에 관해서는 여러가지의 형상이 유효하지만, 반사막을 형성한 경우에는 원 또는 대략 직사각형이 특히 바람직하다. If one is available the various shapes with regard to the shape of the case planar shape of the dot that is, the light guide plate as viewed from the front side, but to form a reflective film, it is particularly preferred source or a substantially rectangular shape. 대략 직사각형이라고 하는 것은 직사각형을 포함하고 직사각형의 각에 둥그스름한 부분이 있는 도형, 직사각형에 대해서 1변의 길이가 변형된 사다리꼴에 가까운 형태를 의미한다. It is approximately as a rectangle 1 refers to the form close to a modified trapezoidal side length with respect to a shape including a rectangle and with a rounded portion of each of the rectangle, the rectangle. 반사막이 없는 경우, 대략 직사각형이 적합하다. If there is no reflective film, it is appropriate for substantially rectangular. 그 이유는 도광판내의 산란광을 감소시켜서 휘도향상을 도모하기 위함이다. The reason for this is to achieve a brightness enhancement by reducing the scattered light in the light guide plate. 도트의 크기는 평면형상이 원형인 경우, ψ200㎛이하, 평면형상이 대략 직사각형이나 그 밖의 도형인 경우, 짧은 변의 길이가 200㎛이하인 것이 바람직하다. If the size of a dot is a circular plane shape, ψ200㎛ below, if the plane shape is substantially rectangular or other shapes, it is preferable that a shorter side length than 200㎛. 그 이유는 도트의 크기가 이것보다 크게 되면, 퍼스컴 등의 사용자가 액정표시장치를 바라본 경우, 문자나 도안에 따라서는 도광판에 형성한 도트의 형상이 보이게 되어(도트가 보임), 문자, 도면의 판별에 방해가 되기 때문이다. If the reason is that the size of the dot larger than the other hand, when the user, such as personal computers, seen a liquid crystal display device, this therefore has the shape of a dot formed on the light guide plate to the letter or pattern is visible (the dots are visible), a character, a diagram of because they interfere with the determination. 하한으로서는 10㎛인 것이 바람직하다. As to the lower limit 10㎛ preferred. 그 이유로서는 10㎛보다 작으면 도트의 수가 너무 증가해 버려 제조가 곤란하게 되기 때문이다. Drop to the reason as smaller than the number of dots so 10㎛ increase is because the manufacturing is difficult. 도트의 평면적배치는 랜덤인 것이 필요하다. Two-dimensional arrangement of the dot is required to random. 그 이유는 본 발명의 도트는 미세하기 때문에 액정표시장치를 구성하는 그 밖의 부재 예를 들면 액정셀, 컬러필터, TFT패턴, 블랙스트라이프 등의 규칙적패턴과 간섭해서 발생하는 므와레를 방지하기 위함이다. The reason is that the other members, for example to prevent the liquid crystal cell, the color filter, TFT pattern, the black stripes, such as a regular pattern with the generation by interference moire and rail to the intended constituting the liquid crystal display device because the fine dots of the invention to be. 도트의 평면형상이 대략 직사각형인 경우, 그 배치는 직사각형의 긴변이 광원에 대해서 대략 평행하게 배치하는 것이 좋다. When the planar shape of the dot is substantially rectangular, the arrangement may be arranged substantially parallel to the long sides of the rectangular light source. 그 이유는 출사각분포의 적정화가 쉽게 도모되기 때문이다. The reason is that the adequacy of the emission angle distribution to be achieved readily. 도트의 밀도는 휘도분포의 균일화를 도모하기 위해 광원에 가까울수록 도트밀도를 작게 한다. The density of dots are as close to the light source less the dot density to achieve a uniform luminance distribution. 본 발명의 액정표시장치를 구성하는데에 있어서 불가결한 부자재로서는 반사막이 없는 경우에는 반사시트 및 프리즘시트가 있다. If there is no as an integral auxiliary reflective film according to the configuration in the liquid crystal display device of the present invention has a reflective sheet and a prism sheet. 이들 부자재는 휘도의 향상, 출사각도의 적정화를 실행하는데에 있어서 불가결하다. These auxiliary materials is essential to run in the optimization of the enhancement of luminance, the output angles. 또한, 반사막의 유무에 관계없이 프리즘시트, 확산시트 등, 종래 사용되어 오던 부자재를 필요에 따라서 병용하는 것은 휘도향상, 휘도분포의 적정화, 출사각도의 적정화에 유효하다. In addition, it is used in combination as necessary a prism sheet, a diffusion sheet and the like, auxiliary ohdeon is conventionally used with or without a reflection film is effective in the optimization of the optimization, the exit angle of the brightness enhancement, brightness distribution. 이하, 본 발명의 실시예를 도면에 따라서 상세하게 설명한다. Hereinafter, the embodiment of the present invention will be specifically described with reference to the drawings. 제 1 도는 본 발명의 액정표시장치에 사용되는 배면조명부의 사시도, 제 2도는 제 1도의 도광판(2)의 반사사면으로 되는 작은 볼록부(10)을 도시한 사시도이다. A first turning perspective view showing the small convex portion 10, which is a reflective surface of a rear perspective view of the illumination portion, the second turning the first light guide plate (2) degrees, that is used for a liquid crystal display of the present invention. 이 액정표시장치에 있어서의 배면조명부는 광원(1), 도광판(2), 반사막(11) 또는 제 1도 제 2도에 도시하고 있지 않지만 제 3도에 도시한 반사시트(8)을 최소 구성요소로 하고 있고, 도광판(2)에는 이면에 클레이터형상의 반사사면(10)(이하 작은 볼록부라 한다)이 형성되어 있고, 이 작은 볼록부(10)을 따라서 반사막(11)이 형성되어 있다. A back lighting unit includes a light source 1, a light guide plate (2), the minimum configuration for a reflective film 11 or the first reflection sheet 8 illustrated in FIG. 3 also does the not shown in Figure 2 in the liquid crystal display device and to the elements, a light guide plate (2) (the bridle or less small convex) reflective surface 10 of the clay emitter shape is a is formed, a reflective film 11 are formed along the small convex portions 10 . 작은 볼록부(10)은 기본적으로는 랜덤하게 배치되어 있다. Small convex portion 10 is basically are arranged randomly. 제 5도는 제 1도의 도광판(2)내를 진행하는 도광판 도파광(12)의 광선궤적을 도시한 것이다. Fifth turn shows a ray trace of the first-degree light guide plate (2) guided light guide plate 12, which proceeds in the. 제 5도에 있어서, 광원(1)로부터의 출사광은 도광판(2)의 좌측끝면(7)에서 도광판 입사광(9)로서 도광판(2)에 입사하여 도광판 도파광(12)로 되고, 다른쪽의 끝면(우측끝)을 향해서 도광판하면(13) 및 광투과면(16)에서 전체 반사를 반복하면서 진행한다. The method of claim 5 degrees, and to the output light is a light guide plate (2) a light guide plate guiding light 12 incident on a light guide plate incident light (9) from the left end surface 7 of the light guide plate 2 from the light source 1, and the other the lower surface of the light guide plate toward the end surface (right end) advances while repeating the total reflection at 13 and the light transmitting surface (16). 도광파(12) 중 작은 볼록부 경사면(15)에 입사한 광은 반사되어 광투과면(16)에 닿고 거기에서 굴절되어 광투과면(16)에서 출사해서 액정표시소자에 조명광으로서 입사한다. A light guide wave light incident to the small convex portion inclined surface (15) of 12 is reflected touching the light-transmitting surface 16 bends from there is incident as illumination light to the liquid crystal display device to exit from the light transmitting surface (16). 또, 도파광(12) 중 작은 볼록부 바닥면(14)에 입사한 도파광은 작은 볼록부 바닥면(14)로 입사해서 그 일부가 또 작은 볼록부 경사면(15)에 입사하고, 거기에서 반사되어 광투과면(16) 즉 광투과면에서 출사한다. The guided light 12 of the small projections guided light incident on the bottom surface 14 is incident on the small convex portion bottom surface 14 to a portion thereof again enters the small convex portion slope 15, and from there It is reflected and emitted from the light-transmitting surface 16 that is the light-transmitting surface. 따라서, 작은 볼록부(10) 및 반사막(11)을 적정하게 배치하는 것에 의해 도파광(12)을 서서히 도광판(2)에서 출사시켜 액정표시소자를 조명할 수 있다. Therefore, by gradually emitted from the light guide plate (2), the optical waveguide 12 by appropriately placing the small convex portion 10 and the reflective layer 11 can illuminate the liquid crystal display device. 제 6도는 도광판(2)에서 액정표시소자로의 광선의 출사각을 설명하기 위해 도시한 도광판내 도파광 및 반사광의 광선궤적을 도시한 도면이다. Claim 6 is a graph illustrating a locus of the light beam within the optical waveguide, and the reflected light showing the light guide plate in the figure for turning the light guide plate (2) illustrating the output angle of light to the liquid crystal display device. 제 6도에 있어서, 도광판 입사각 확산각 α는 광원(1)에서 발하는 광의 도광판(2)에 입사할 때의 각도, 즉 도광판(2)의 좌측끝면(7)의 각도, 도광판(2)를 구성하고 있는 물질의 귤절률에 의해 결정된다. In Figure 6, the light guide plate incident angle spread angle α is configured to angle, a light guide plate (2) of the angle, that is, the light guide plate 2, the left end surface (7) of the time of incidence on the light guide plate (2) emitted by the light source (1) and it is determined by the orange jeolryul of materials which. 제 6도에 도시한 바와 같이 도광판(2)의 좌측끝면(7)의 각도가 광투과면(16)에 대해서 직각이고, 도광판(2)의 굴절률이 아크릴수지와 같이 일반적인 플라스틱 재료인 경우에는 α는 약 ±40°로 된다. When first and 6 also a right angle is the angle of the light guide plate 2, the left end surface (7) with respect to the light transmitting surface 16, as shown in, the refractive index of the light guide plate (2) is a general plastic material such as acrylic resin, α is at about ± 40 °. 또한, 기하학적으로 생각할 때 α가 마이너스의 각도를 갖는 광은 직접 작은 볼록부(10)에 입사하는 일은 없다. Further, when considering the geometrical optical α is an angle of the negative it can not work directly incident on the small convex portions 10. 여기서, 작은 볼록부 단면경사각을 θ로 하고, 작은 볼록부 깊이를 d로 한다. Here, the small projections with cross-sectional inclination angle θ, and the small projections with a depth d. 또, 작은 볼록부 경사면(15)에서 반사된 광의 출사각을 작은 볼록부 반사광 출사각이라 하며 이것을 δ로 하고, 작은 볼록부 바닥면(14)와 작은 볼록부 경사면(15)에서 반사된 광의 출사각을 δ'로 한다. Further, small projections inclined as 15 small projections reflection light emitting the light emitting angle reflected by the respective, and to do this as δ, a small convex portion bottom surface of the light emitting reflected at 14 and the small convex portion slope 15 and the angle of δ '. 제 7도는 α와 δ의 관계를 도시한 도면으로서, 도면중의 수치는 θ를 나타내고 있다. Claim 7 as a turning diagram illustrating a relationship between the α and δ, the value of the figure shows a θ. 여기서, δ이 마이너스인 경우, 출사광은 광투과면(16)에 직각인 수직선에 대해 좌측으로 출사하는 것을 의미한다. Here, if the δ is negative, the outgoing light means for emitting to the left with respect to a perpendicular to the light transmitting surface 16 vertical. 제 7도에서 도파광 중 작은 볼록부 경사면(150에 입사된 광은 광투과면(16)에서 임의의 각도분포를 갖고 출사한다는 것을 알 수 있다. 예를 들면, θ가 35°인 경우, δ는 ±30°로 되며, 적절한 각도분포의 광이 도광판(2)의 광투과면(16)에서 출사하는 것을 알 수 있다. 마찬가지로 해서 도 8은 α와 δ'의 관계를 도시한 도면이다. 제 8도 제 7도와 마찬가지로 광은 광투과면(16)에서 임의의 각도분포를 갖고 출사하는 것을 알 수 있다. 여기서, 제 7도,제 8도에서 적절한 θ의 값이 20~60°이고, 특히 35°±10°로 하는 것에 의해 출사광이 적절한 각도로 액정표시소자를 조명하는 것을 알 수 있다. The incident on the toned guided light small projections inclined surface (150 of in the light can be seen that the exit has a random angular distribution at the light transmitting surface 16. For example, when θ is 35 °, δ is a ± 30 °, it can be seen that an appropriate angular distribution of light emitted from the light transmitting face 16 of the light guide plate (2) to 8 similarly is a diagram illustrating a relationship between the α and δ '. the 8 likewise help seventh light can be seen that the exit has a random angular distribution in the light-transmitting surface 16, where the seventh degree, the value of the appropriate θ in claim 8 Fig 20 ~ 60 °, and in particular 35 ° ± 10 ° to the can by the emitted light can be seen that illuminating the liquid crystal display device at an angle. 따라서, 본 발명의 의하면 종래 다수의 부품 즉 광원(1), 도광판(2), 확산시트(3), 프리즘시트(4), (5), 반사시트(8) 등으로 구성되어 있던 배면조명부를 광원(1)과 도광판(2)만으로 구성할 수 있고, 이것에 의해서 휘도의 향상, 부품가격과 조립공정수의 저감을 도모할 수 있다. Therefore, according to the present invention, the rear illumination that consists of a conventional multiple components means that the light source 1, a light guide plate (2), a diffusion sheet 3, prism sheets 4 and 5, the reflection sheet 8, such as may be composed of only the light source 1 and the light guide plate (2), can be reduced for improvement of the brightness, number of parts cost and assembly process by this. 또, 본 발명에 의하면 종래 장치의 구성에서 문제였던 반사시트(8)과 도광판(2) 사이에 먼지가 혼입되는 것에 의한 광이용효율변화 및 휘도불균일 발생이 없는 안정된 특성을 가진 액정표시장치가 얻어진다. Further, according to the present invention is a liquid crystal display device having a light use efficiency variation and stable characteristics with no luminance non-uniformity occurs due to the dust is entrained between the reflection sheet 8 and the light guide plate (2) which was a problem in the structure of the conventional device is obtained It is. 다음에, 도광판(2)의 작은 볼록부(10)의 여러가지의 형상에 관해서 더욱 상세하게 설명한다. Next, a more detailed description will be given to the various shapes of the small projections 10 of the light guide plate (2). 제 9도는 본 발명에서 사용되는 도광판(2)의 주요부 사시도, 제 10도는 도광판(2)의 작은 볼록부(10)의 부분단면도이다. Ninth turn a partial cross-sectional view of a small convex portion 10 of a main part perspective view, the light guide plate 10 turns (2) of the light guide plate (2) used in the present invention. 이 실시예에서는 작은 볼록부(10)의 형상은 대략 원추형을 하고 있으며, 반사막(11)의 이면에 보호막(19)가 형성되어 있다. In this embodiment, there is formed a protective film 19 on the back surface of the shape of the small convex portion 10 is generally conical, and a reflective film (11). 보호막(19)는 반사막(11)의 반사율의 경시변화를 방지하고, 반사막(11)의 물리적손상을 방지하는데에 유효하다. Protective film 19 prevents a change over time in the reflectance of the reflection film 11, and it is effective for physical damage to the reflective layer 11 to prevent the. 제 11도는 제 10도에 도시한 도광판(2)내를 진행하는 도광판 도파광의 광선궤적을 도시한 도면이다. The turning a light guide plate (2) as shown in claim 10, 11 is a view showing a light guide plate guiding the light beam to trace the progress within. 작은 볼록부(10)의 형상을 원추형으로 하면, 앞서 기술한 도 5에 있어서의 작은 볼록부 바닥면(14)가 없으므로 작은 볼록부 반사광은 작은 볼록부 경사면에 입사된 도파광만으로 되고,제 7도에 도시한 관계에 의해 광투과면(16)에서 출사된다. When the shape of the small convex portion 10 in a conical shape, because the small convex portion bottom surface 14 in Fig. 5 described above small projections reflected light is only the guided light incident on the small convex portion slope, 7 It is emitted from the light transmitting surface 16 by a relation shown in Fig. 따라서, 조명광의 출사각도분포의 제어가 보다 간단하게 된다. Therefore, the control of the output angle distribution of the illumination light is simplified. 제 12도는 작은 볼록부(10)의 그 밖의 실시예의 단면형상을 도시한 단면이다. Claim 12 is a turning showing the other embodiment of the cross-sectional shape of the small convex portion 10 side. 제 12도a는 작은 볼록부(10)의 단면형상이 사다리꼴이고, 반사막(11)의 이면에 보호막(19)를 형성한 예를 도시한 도면이다. Claim 12 is also a sectional shape of the small convex portion 10 is trapezoidal, a diagram showing an example of forming the protective film 19 on the back surface of the reflective layer 11. 제 12도b는 작은 볼록부(10)의 단면형상이 대략 사다리꼴이고, 에지가 완만한 R형상을 한 예이다. Claim 12 also b is approximately the cross-sectional shape of the small convex portion 10 is trapezoidal, an example in which the R shape one edge of which is moderated. 이 형상은 실제로 도광판(2)를 형성할 때의 제조조건의 편차를 고려한 경우에 유효한 형상으로 된다. This shape is actually the case in consideration the variation in the manufacturing conditions for forming the light guide plate (2) as a valid shape. 또, 반사막(11)의 형성에 있어서 이 에칭이 완만한 R형상은 반사막(11)의 부착주위를 향상시키는데에 효과가 있다. Further, in forming the R-shaped etching is slow in the reflective layer 11 is effective in improving the adhesion around the reflective layer 11. 제 12도b의 작은 볼록부 경사각 θ는 도시한 바와 같이 정의할 수 있다. Claim 12 is also a small convex portion of the inclination angle θ b is defined as shown. 제 12c도는 작은 볼록부(10)의 단면형상이 비대칭인 예로서, 작은 볼록부 바닥면(14)가 존재하고 있어도 도파광의 반사가 작은 볼록부 바닥면(14)에서 거의 발생하지 않게 할 수 있다는 장점이 있다. Claim 12c to turn it can hardly suffer from generation of the small convex portions 10, a small convex portion bottom surface 14 may be present guided light reflected is small convex portion bottom surface 14 as an example cross-sectional shape is asymmetric in there is an advantage. 제 12d도는 작은 볼록부(10)의 바닥면(14)의 길이가 짧은 예를 도시한 도면이다. The 12d turns a diagram, the length of the bottom surface 14 of the small projections (10) shows a short example. 제 12도c와 마찬가지로 도파광의 반사가 작은 볼록부 바닥면(14)에서 거의 발생하지 않게 할 수 있다는 장점이 있다. Article 12 also has the advantage that it can hardly suffer from generation of in the same manner as c guided light reflection is small convex portion bottom surface (14). 제 12e도는 두꺼운 보호막(19)를 형성한 예를 도시한 도면이다. The 12e turns a view showing an example in which a thick protective film 19. 실용상 스핀코팅, 롤코팅에 의해 보호막(19)를 형성한 경우, 이와 같이 보호막(19)를 두껍게 하는 쪽이 작업성이 향상된다. When forming the protective film 19 by the practical spin coating, roll coating, this side thus to increase the protective film 19 is improved in workability. 또한, 제 12도b의 에지가 완만한 R형상은 단면형상이 사다리꼴에만 한정되는 것은 아니고 그 밖의 형상에 관해서도 적용할 수 있다. Furthermore, the R 12 also shape one edge of which is moderated b is not necessarily to be a trapezoid cross-sectional shape is limited only can be applied with regard to the other shape. 작은 볼록부(10)의 높이D는 특히 한정되는 것은 아니지만, 도파광의 반사를 효율좋게 실행하기 위해 작은 볼록부(10)의 1/2이상이 1㎛이상, 더욱 바람직하게는 5㎛이상인 것이 바람직하다. It is a small height D of the convex section 10 is not particularly limited, the waveguide preferably more than 1/2 of the small convex portion 10 to execute the light reflected efficiently 1㎛ or more, and more preferably not less than 5㎛ Do. 그 이유는 작은 볼록부(10)의 높이가 낮으면 반사광의 강도가 감소하는 것, 또 도파광이 산란하기 쉽게 되어 도광판(2)의 하면을 단순히 거칠게 하는 것과 동일하게 되어 버리기 때문에 이다. The reason for this is because the dumping is the same as if the height of the small convex portion 10 to lower the intensity of the reflected light decreases, again making it easy to scatter guided light is simply the lower face of the light guide plate (2) rough. 작은 볼록부의 크기는 마찬가지의 이유에 의해 1/2이상이 1㎛이상인 것이 바람직하다. Small size of the convex portion is preferably at least 1/2 or more the 1㎛ by the same reason. 작은 볼록부의 크기, 높이의 예를 제 10도,제 11도의 원추형의 작은 볼록부(10)의 예에서 구체적으로 나타내면, 원추의 경우, 그 직경이 약 50μmm, 각도 θ가 약 35°, 높이D가 약 18㎛이다. Small convex portion size, represents an example of a height in detail in claim 10 also, an example of a 11-degree small projections of the conical section 10, in the case of a cone, the diameter of about 50μmm, angle θ is about 35 °, the height D It is about 18㎛. 단, 상기 치수는 본 발명을 한정하는 것은 아니고, 기준을 부여하는 것이다. However, the dimension is to give a reference, not intended to limit the present invention. 광원(1)로부터의 광강도는 일반적으로 도광판(2)내에서 광원(1)에서 멀어짐에 따라 저하하므로, 그것에 따라서 작은 볼록부(10)의 밀도, 높이 또는 크기를 변화시켜 작은 볼록부(10)의 반사광의 강도분포 즉 휘도가 도광판(2)의 전면에 걸쳐서 균일하게 되도록 한다. Light intensity from the light source 1 is usually a light guide plate (2), so in the decrease in accordance with increasing distance from the light source (1), to thus vary the density, height or size of the small convex portions 10 on it small projections (10 the intensity distribution of the reflected light) that is such that the luminance is uniform over the entire surface of the light guide plate (2). 본 발명에서는 단일광원의 경우, 작은 볼록부(10)의 밀도는 광원측 끝면(7)에서 상대하는 도광판끝면을 향해서 지수함수적 또는 누승적으로 증가하도록 형성하는 것이 좋다. According to the present invention for a single light source, the density of the small projections 10 may be formed so as to increase exponentially or a power ever toward the light guide plate relative to the end face on the light source side end face (7). 그러나, 광원측끝면(7)과 상대하는 도광판끝면에서의 광의 반사를 고려하면, 상기 상대하는 도광판끝면의 근방에서는 끝면에 가까워짐에 따라 그의 밀도를 감소시키는 것이 휘도의 균일화를 도모할 수 있는 경우가 많다. However, a case can be made uniform in luminance for considering the reflection of light from the light pipe end faces for contact with the light source end surface (7), in the vicinity of the light guide end surface of the relative decrease of its density according to the closer to the end face many. 다음에, 본 발명의 액정표시장치의 배면조명부의 구성을 제 13도에 의해 설명한다. Next, a description will be given by the back lighting unit in the configuration of a liquid crystal display of the present invention of claim 13 degrees. 제 13도a는 단일광원, 쐐기형 도광판의 예를 도시한 도면이다. Claim 13 also is a view showing an example of a single light source, a wedge-shaped light guide plate. 광원(1)로부터의 거리에 반비례해서 두께를 감소시킨 도광판(2)를 사용한 것에 특징이 있으며, 도광판 출사광의 강도분포의 균일화와 도광판 두께의 저감, 경량화에 유효하다. Reduction of the equation and the light guide plate, and the thickness of the light guide plate exit light intensity distribution characterized by using the light guide plate (2) that by reducing the thickness in inverse proportion to the distance from the light source (1), is effective for weight reduction. 제 13도b는 단일광원을 사용하고, 광원(1)와 반대측의 도광판 끝면에 경사를 갖게 한 예로서, 도파광 중 광투과면에서 출사되지 않고 광원(1)과 반대측의 도광판끝면까지 도달한 도파광의 각도를 변화시켜 도파광 출사를 용이하게 한 것을 특징으로 한다. Claim 13 also b is a single light source, the light source (1) and by way of example which gave an inclination to the light guide plate end face on the opposite side, it is not emitted at the light transmitting side of the guided light light source (1) and reaches up to the light guide plate end face on the opposite side by changing the angle of light wave guide it is characterized in that to facilitate the light output waveguide. 이것에 의해 도광판 출사광의 강도분포의 균일화가 용이하게 되고 또 광손실을 저감할 수 있다. It becomes easy to uniform the light guide plate exit light intensity distribution can also be reduced by the light loss. 제 13도c, 제 13도d는 광원(1)측의 도광판끝면(7)을 도광판 입사광 확장각 α를 조정하기 위해 오목형상, 볼록형상으로 한 예를 도시한 도면이다. FIG claim 13 c, the 13 degree d is a diagram showing an example in a concave shape, a convex shape in order to adjust the angle α extends the light guide plate incident end surface 7 of the light source 1 side, light guide plate. 광투과면 출사광의 각도분포의 제어에 유효하다. If the light transmission is effective for the control of the outgoing light angle distribution. 제 13도e는 2광원형이고, 도광판(2)로서 평판을 사용한 예를 도시한 도면이다. The 13 degree e is 2, the light circle, a view showing an example using a flat plate as a light guide plate (2). 제 13도f는 2광원형이고, 광원(1)로부터의 거리의 차에 의한 휘도불균일을 보상하기 위해 도광판(2)의 두께를 변화시킨 예이다. F claim 13 Figure 2 is an optical circular and, for example, for changing the thickness of the light guide plate (2) to compensate for non-uniformity in luminance due to difference in distance from the light source (1). 상기 배면조명부의 구성은 도시한 것에 한정되는 것은 아니고 각각을 조합해서 구성하는 것이 가능하다. The configuration of the rear lighting unit is not limited to those shown, it is possible to configure a combination of each. 다음에, 본 발명의 다른 실시형태를 설명한다. Next, a further embodiment of the present invention. 제 14도,제 15도는 본 발명의 다른 실시예를 도시한 도면이다. Figure 14 is a fifteenth view illustrating a further embodiment of the present invention leads. 제 14도,제 15도의 실시예는 제 25도에 도시한 실시예에 비해 반사막(11) 대신에 반사시트(8)을 배치한 것에 특징이 있다. 14 degrees, 15 degrees for example, the embodiment is characterized in placing a reflection sheet 8 in place of the reflective layer 11 than in the embodiment shown in FIG 25. 반사시트(8)로서는 백색의 시트를 사용하는 것이 가능하며 반사율을 향상시킬 수 있다. Reflection sheet 8 as is possible to use the white of the sheet, and it is possible to improve the reflectance. 제 15도는 제 14도의 실시예의 작은 볼록부(10)의 단면형상과 반사시트(8)의 배치관계를 도시한 도면이다. Claim 15 is a view showing the turning arrangement of the cross-sectional shape and a reflective sheet (8) of claim 14 degrees embodiment small projections (10). 제 16도는 이 실시예의 광선궤적 결과를 도시한 도면으로서, 반사시트(8)에서 반사된 광은 재차 도광판(2)내에 들어가 진로가 변환되고 도광판(2)의 상면에서 출사되어 액정표시소자의 조명광으로서 기능한다. Claim 16 degrees is emitted from the upper surface of the embodiment of light a view showing the locus a result, the light reflected by the reflection sheet 8 is a course falls within the re-light guide plate (2) converts the light guide plate (2) illuminating light of a liquid crystal display element functions as a. 제 17a~도 제 17d는 작은 볼록부(10)의 형상을 도시한 도면으로서, 제 12a~제 12도d의 실시예에 대응하며 반사시트(8)을 이들 도광판(2)의 바닥면에 배치하는 것에 의해 백라이트로서 기능한다. The 17a ~ Fig claim 17d are diagrams showing the shape of the small convex portions 10, a 12a ~ claim 12, also arranged corresponding to the embodiment of the d and the reflection sheet 8 on the bottom surfaces of the light guide plate (2) functions as a backlight by. 제 18도는 도광판(2)의 바닥면에 반사사면으로서 작은 오목부를 형성한 실시예의 사시도이다. 18 is a perspective view of a turning embodiment form a small recess as the reflecting surface to the bottom surface of the light guide plate (2). 작은 오목부(10')는 상술한 실시예의 작은 볼록부(10)과 마찬가지로 도광판(2)내에 입사한 광의 진로를 변경할 수 있다. Small recess 10 'may change the course of the light incident into the light guide plate, like 2 and the example small projections 10 of the above-described embodiments. 작은 오목부(10')는 작은 볼록부(10)에 비해 다음과 같은 특징이 있다. Small recess 10 'has the following characteristics compared to the small convex portion 10. 도트의 수, 크기가 동일한 경우, 작은 오목부(10')의 쪽이 광진로변경효과가 크다. number of dots, when the size of the same, the side of a small recess 10 'is greater is changed to Gwangjin effect. 아크릴 등의 재질을 사용하여 사출성형해서 도광판(2)를 얻는 경우, 작은 오목부(10')의 쪽이 성형 결함이 적은 성형품이 얻기 쉽다. by injection molding using a material such as acrylic to obtain a light guide plate (2), the side of a small recess 10 'is less likely to obtain a molded article forming defects. 작은 오목부(10')의 형상으로서는 제 19도,제 20도에 도시한 직사각형 형상이 바람직하다. The shape of the small recess 10 ', FIG. 19, the rectangular shape shown in Figure 20 is preferred. 또, 제 20도에 도시한 반사각 θ 및 작은 오목부(10')의 깊이 H는 각각 표 1에 도시한 작은 볼록부(10)과 마찬가지로 35°±15°바람직하게는 35°±10°, 2~40㎛가 바람직하다. In addition, the 20 degrees one angle of reflection θ and the small recesses 10 ', the depth H is 35 ° similarly to the small convex portion 10 shown in each of Table 1 shown in ± 15 ° preferably 35 ° ± 10 °, the 2 ~ 40㎛ it preferred. 제 21도는 이 단면형상의 3가지 예를 도시한 도면이다. 21 is a view showing three examples of the cross-sectional shape leads. 제 22도는 작은 오목부(10')를 형성한 경우의 광선궤적을 도시한 도면이다. 22 degrees is a view showing the light trajectory in the case of forming a small recess 10 '. 또 제 23도에는 작은 오목부(10')의 랜덤한 평면적배치를 도시하였다. In claim 23, was also shows a two-dimensional random arrangement of the small recesses 10 '. 제 22도 있어서, 입사광이 작은 오목부(10')의 측면에서 반사되고 광로가 변환되어 유효한 조명광으로 된다. 22 Fig, incident light is reflected from the side of a small recess 10 'is the optical path is converted to the effective illumination. 다음에, 작은 볼록부, 작은 오목부의 적절한 크기, 형상에 관해서 기술한다. Next, a small convex portion, a small concave portion suitable size, described with reference to the shape. 작은 볼록부(10), 작은 오목부(10')의 크기는 형상이 대략 정방형인 경우, 한변의 길이는 200㎛, 바람직하게는 100㎛이하인 것이 바람직하다. If small convex portions 10, the size of a small recess 10 'has the shape of an approximately square shape, the length of one side is 200㎛, and preferably not more than 100㎛. 또, 작은 볼록부(10), 작은 오목부(10')의 형상이 원인 경우, 직경은 200㎛, 바람직하게는 190㎛이하인 것이 바람직하다. Also, if the shape of the small convex portion 10, the small recesses 10 'causes the diameter is preferably 200㎛, preferably 190㎛ or less. 마찬가지로, 작은 볼록부(10), 작은 오목부(10')의 형상이 직사각형인 경우, 짧은 변의 길이는 200㎛, 바람직하게는 100㎛ 이하인 것이 바람직하다. Likewise, if the shape of the small convex portions 10, a small recess 10 'rectangular shorter side is 200㎛, and preferably not more than 100㎛. 그 이유는 만약 이 이상 작은 볼록부(10), 작은 오목부(10')가 크면, 액정표시패널을 접근해서 바라본 경우에 백라이트의 휘점으로 되는 작은 볼록부(10), 작은 오목부(10')를 눈으로 판별할 수 있게 되어, 액정표시가 나타내는 문자, 그림을 판별하는 경우의 방해로 되기 때문이다. The reason is that if more than a small convex portion 10, a small recess 10 'is large, a small convex portion 10, which is the bright spot of the backlight when viewed by accessing the liquid crystal display panel, small recesses (10' ) is due to be able to determine the eye, it is disturbed in the case to determine the character, an illustration of the liquid crystal display indicates. 한편, 작은 볼록부(10), 작은 오목부(10')의 크기는 형상이 대략 정방형인 경우, 한변의 길이는 10㎛이상, 또 작은 볼록부(10), 작은 오목부(10')의 형상이 원인 경우, 직경은 10㎛이상인 것이 바람직하다. On the other hand, a small convex portion 10, a small recess 10 'when the shape of an approximately square shape, the length of one side is more than 10㎛, yet small convex portions 10, a small recess (10 size ") when the shape causes, the diameter is preferably not less than 10㎛. 또, 작은 볼록부(10), 작은 오목부(10')의 형상이 직사각형인 경우, 짧은 변의 길이는 10㎛이상인 것이 바람직하다. Further, when the shape of the small convex portions 10, a small recess 10 'of rectangular shape, the short side length is preferably at least 10㎛. 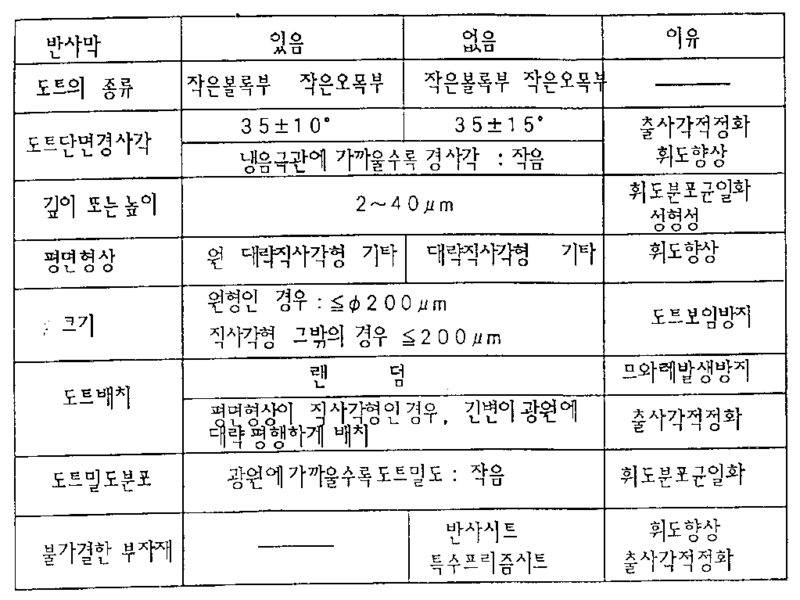 그 이유는 만약 이것보다 작은 볼록부(10), 작은 오목부(10')를 작게 한 경우, 도광판(2)의 전면에 형성하는 도트의 수가 팽대하게 되고 또 정확하게 도트를 제조하는데에 시간이 걸리기 때문이다. The reason is that it takes time for the manufacture of a small convex portions 10, when a small a small recess 10 ', the number of dots to be formed on the entire surface of the light guide plate (2) and the swollen again exactly dots than if it Because. 제 24도는 작은 볼록부를 가진 도광판과 조합하면 유효한 프리즘시트(4)의 단면형상을 도시한 것이다. The combination of claim 24 and a light guide plate having an small convex turn shows a cross-sectional shape of the effective prism sheet 4. 제 25도는 작은 오목부(10')를 갖는 도광판(2)와 반사시트(8), 프리즘시트(4)를 조합해서 배치한 배면조명부를 도시한 것이다. 25 degrees is a showing a rear lighting unit arranged to combine the light guide plate 2 and the reflection sheet 8, a prism sheet (4) having a small recess 10 '. 여기서, 프리즘시트(4)의 각도 θp1, θp2는 도광판(2)로부터의 출사광을 패널에 대해서 연직방향의 광강도를 가장 높게 하기 위해 작은 오목부(10')의 단면경사각을 35°±15°, 바람직하게는 35°±10°로 한 경우, 각각 80~88°, 20~40°가 바람직하다. Here, the angle of the prism sheet (4) θp1, θp2 is a cross-sectional inclination angle of 35 ° ± 15 of the small recess 10 'to the higher light intensity in the vertical direction with respect to the light emitted from the light guide plate (2) to a panel If you decide °, preferably 35 ° ± 10 °, respectively 80 ~ 88 °, 20 ~ 40 ° it is preferred. 제 25도에 도시한 배면조명부에 있어서 프리즘시트(4)가 없는 경우에는 도광판 입사광이 작은 오목부(10')에서 반사해서, 도광판 출사면에 대해서 경사(제 25에서 수직방향에서 우측으로 경사)방향으로 휘도가 높은 출사광이 나온다. The method of one rear lighting unit shown in claim 25 without a prism sheet 4 is inclined with respect to the light guide plate output surface by reflection in the light guide plate incident light is small recesses 10 '(inclined to the right side in the vertical direction in claim 25) the brightness in a direction emerges with the high output light. 출사각도와 휘도의 관계를 제 도26a에 도시한다. The relationship of the exit angle and the luminance is shown in Fig 26a. 이것에 대해서 상기와 같은 프리즘시트(4)를 배치하면, 경상방향으로 출사한 광이 프리즘에서 굴절되어 수직방향의 휘도가 높아진다. On the other hand when placing the prism sheet 4 as described above, the light emitted to the current direction is refracted by the prism increases the brightness in the vertical direction. 이 상태를 제 도26b에 도시한다. Claim This state is shown in Figure 26b. 이와 같은 구성으로 하는 것에 으해 산란광의 분석을 억제하여 정면휘도가 높은 배면조명부를 얻을 수 있다. In this way as to the same configuration of the restriction analysis of the scattered light can be obtained euhae a rear lighting unit is higher front brightness. 프리즘시트(4)의 각도 θp1, θp2는 상술한 바와 같이 작은 오목부(10')의 각도에 의해 최적화할 수 있다. Angle θp1, θp2 of the prism sheet 4 may be optimized by the angle of the small recesses 10 ', as described above. 다음에, 본 발명의 액정표시장치의 배면조명부에 사용되는 도광판의 제조방법에 대해서 설명한다. Next, a description will be given of a manufacturing method of the light guide plate used in the back lighting unit of a liquid crystal display of the present invention. 도광판의 제조방법으로서는 기본적으로 금형을 제작하고 플라스틱 성형해서 제조한다. Examples of the method for producing the light guide plate by default to produce a mold, and produced by molding plastic. 이 금형의 제조방법으로서는 여러가지의 기계가공법, 예를 들면 드릴가공, 절삭, 연마 등의 방법을 사용할 수 있다. As the method of manufacturing the mold can be used various methods such as a machining process, for example, drilling, cutting, grinding. 또, 방전가공법도 유효한 수단이다. The discharge processing method is also an effective means. 단, 본 발명의 작은 볼록부(10) 또는 작은 오목부(10')로 이루어지는 반사사면은 일반적인 설계로 그 수가 200~20000개/평방cm이고, 도광판 전체로서는 팽대한 수로 되므로 다음에 기술하는 제조방법을 적용하는 것이 좋다. However, since a reflective surface consisting of small projections (10) or a small recess 10 'of the present invention is that the number of 200 ~ 20,000 / square cm in a typical design, the light guide plate as a whole a swollen channel manufacturing to be described in the following It advised to apply the method. 제 도27은 도광판(2)의 제조방법의 1실시예를 도시한 공정도이다. Claim 27 is a process drawing showing an embodiment of a method of manufacturing a light guide plate (2). 이 제조방법은  제 도27a에 도시한 바와 같이 기판(20)에 포토레지스트(21)을 형성하는 공정,  작은 볼록부(10)의 반전패턴을 가진 포토마스트(22)(제 도27b)를 제 도27c에 도시한 바와 같이 상기 기판(20)상에 배치하고, 마스크(22)의 위쪽에서 자외선(23)을 조사하고, 그 후 포토레지스트(21)을 현상하고 제 도27b에 도시한 바와 같이 기판(20)에 작은 볼록부(10)의 반전패턴을 형성하는 공정,  제 도27e에 도시한 바와 같이 반전패턴(21)상에 금속도금(25)를 실시하고, 도금층(25)로 이루어지는 플라스틱 성형용 스탬퍼(26)을 형성하는 공정 및  제 도27f에 도시한 바와 같이 상기 스탬퍼(26)을 사용해서 도광판(2)를 플라스틱 성형하는 공정으로 이루어진다. The production method (1) The picture mast (22) having a reverse pattern of the process  The small projections 10 for forming the photoresist 21 to the substrate 20 as shown in Figure 27a ( the Fig. 27b), a first as shown in Fig. 27c arranged on the substrate 20, and irradiated with ultraviolet rays 23 from the top of the mask 22, and the phenomenon that after the photoresist 21, the Fig. as it is shown in 27b forming an inverted pattern of small projections 10 on the substrate 20,  the Figure embodiment the metal plating 25 on the reverse pattern 21, as shown in 27e and the plated layer, as shown in 25 plastic processes and  the FIG. 27f to form a stamper 26 for molding made of using the stamper (26) comprises a step of plastic forming the light guide plate (2) . 여기서, 기판(20)으로서는 두께 2~10mm정도의 경면연마한 유리판 등이 사용된다. Here, the substrate 20, such as a mirror-polishing a glass plate having a thickness of about 2 ~ 10mm are used. 포토레지스트(21)을 형성하기 전에 실란계의 접착성 향상제를 미리 도포해 둘 수 있다. Before the formation of the photoresist 21 may be placed in advance coated with the adhesive improving agent of silane type. 포토레지스트 재료로서는 액상 또는 필름형상의 포지티브형, 네거티브형 재료를 사용할 수 있다. As the photoresist material can be used for positive-working, negative-type material of the liquid or film-like. 제 도27에서는 포지티브형 재료를 사용한 경우의 공정을 도시하였다. In the Figure 27 it is shown the process in the case of using a positive type material. 그 형성방법으로서는 스핀코팅법, 롤코팅법이 있다. As the forming method is a spin coating method, a roll coating method. 포토레지스트(21)의 두께를 제어하는 것에 의해 작은 볼록부(10)의 두께를 변화시키는 것이 가능하다. To vary the thickness of the small convex portion 10, by controlling the thickness of the photoresist 21 is possible. 또, 노출, 현상조건을 고안하는 것에 의해 작은 볼록부(10)의 경사각을 제어할 수 있다. In addition, it is possible to control the inclination angle of the small convex portions 10 by devising an exposure and developing conditions. 포토마스크(22)는 크롬마스크, 필름마스크, 에멀젼 마스크를 사용할 수 있고, 미리 설계한 작은 볼록부(10)의 크기, 수, 분포 등의 데이타를 작성헤 두어 전자빔, 레이저빔 등에 의해 묘화하는 것에 의해 작성할 수 있다. The photomask 22 is chrome mask, it is possible to use a film mask, and an emulsion mask, to writing data such as the size, number, distribution of the small projections (10) designed in advance H. imaged by the electron beam, the laser beam leave by can be created. 도금층(25)를 형성하기 전에 도전막(24)를 형성해 두면, 도금공정의 불균일이 없어 양호한 도금층(25) 즉 스탬퍼(26)을 형성할 수 있다. Leave to form a conductive film 24 prior to formation of the coating layer (25), no non-uniformity in the plating process, it is possible to form a favorable plating layer 25 that is the stamper (26). 도전막(24), 도금층(25)의 재료로서는 여러가지의 금속을 사용할 수 있지만, 균일성, 기계적성능의 점에서 Ni가 최적한 재료이다. As a material of the conductive film 24, the plating layer 25 can use a variety of metal, but the material is a Ni optimum uniformity in, that the mechanical properties. 얻어진 도금층(25)는 기판(20)에서 물리적으로 용이하게 박리하는 것이 가능하고, 필요에 따라서 연마 마무리해서 스탬퍼(26)으로서 사용한다. The resulting plating layer 25 is polished to be in accordance with the available and, if necessary, to easily separated physically from the substrate 20 is used as a stamper (26). 얻어진 스탬퍼(26)은 예를 들면 사출성형기를 마더형(27)에 자석(28), 진공척(29) 등으로 고정시킨다. Obtained stamper 26 is, for thereby fixing the magnet 28 is an injection molding machine to the mother mold 27 g., A vacuum chuck 29 or the like. 제 27도에는 사출성형기에 의해 도광판(2)를 제작하는 방법을 도시했지만, 이 이외의 방법으로서 압출성형, 압축성형, 진공성형 등에 의해 도광판(2)를 성형하는 것이 가능하다. 27 also includes, but illustrating a method of manufacturing a light guide plate (2) by an injection molding machine, it is possible to form the light guide plate 2 by means of a method of a non-extrusion molding, compression molding, vacuum forming. 도광판(2)를 구성하는 재료로서는 투명한 플라스틱 재료 전반을 사용할 수 있다. As a material constituting the light guide plate 2 may be a transparent plastic material in general. 구체예로서는 아크릴계 플라스틱, 폴리카보네이트수지, 폴리아세탈수지, 폴리우레탄계 수지, 자외선경화형의 플라스틱재료가 있다. Specific examples thereof include a plastic material, of an acrylic plastic, polycarbonate resin, polyacetal resin, polyurethane-based resin, ultraviolet curing. 이 중 아크릴계 재료는 투명성, 가격, 성형성의 점에서 우수하며 본 발명에 적합한 재료이다. Among the acrylic material is a material suitable for the present invention is excellent in transparency, price point, moldability. 얻어진 도광판 성형품의 작은 볼록부(10)의 형성면에 반사막(11)을 형성하는 방법으로서는 진공증착법, 스핀코팅법, 롤코팅법이 있지만, 이 중 저항가열, 또는 스퍼터링, CVD 등의 진공증착법이 본 발명에 적합하다. As a method for forming the reflective layer 11 in the forming face of the small convex portion 10 of the resulting light guide plate molded article is a vacuum vapor deposition method of vacuum deposition, spin coating, although a roll coating method, of which resistance heating, or sputtering, CVD, etc. it is suitable for the present invention. 반사막(11)의 재료로서는 여러가지의 금속막, 도전성막이 좋지만, 알루미늄이 가격, 반사율의 점에서 적합하다. As the material for the reflective film 11 but any of the various metal film, conductive film, aluminum is suitable from the viewpoint of price, and reflectivity. 진공증착시에 도광판(2)의 측면에도 반사막(11)을 형성하는 것이 가능하다. In the side of the light guide plate 2 at the time of vacuum deposition it is possible to form the reflective layer 11. 이 경우, 광원(1)로부터의 광을 도입하기 위한 도광판끝면(7)에는 반사막(11)이 형성되지 않도록 필름 등으로 커버할 필요가 있는 것은 물론이다. In this case, the thing that needs to be covered with the light guide plate including an end face (7), the film so that the reflective film 11 is not formed as well as for introducing the light from the light source (1). 반사막용 보호막(19)로서는 여러가지의 플라스틱 필름을 사용할 수 있다. For reflective film protective film 19 may be used as a variety of plastic films. 그 구체적인 예로서는 파라핀계 왁스, 자외선경화형 수지가 있다. The specific examples include a paraffin-based wax, an ultraviolet curable resin. 파라핀계 왁스는 핫멜트타입의 것이 좋고, 롤코팅 등의 방법에 의해 보호막(19)를 형성하는 것이 가능하다. Paraffin wax it is possible to form the protective film 19 by a method such as roll coating may be of the hot-melt type. 제 도28는 도광판(2)의 제조방법의 다른 1실시예를 도시한 공정도이다. Claim 28 is a process diagram showing another embodiment of the method of manufacturing a light guide plate (2). 이 제조방법은  제 도28a에 도시한 바와 같이 스탬퍼원반(30)에 포토레지스트(21)막을 형성하는 공정,  제 도28b에 도시한 바와 같이 작은 볼록부의 패턴을 가진 포토마스크(22)를 상기 스탬퍼원반(30)상에 배치하고, 마스크(22)의 위쪽에서 자외선(23)을 조사한 후, 현상해서 스탬퍼원반(30)에 작은 볼록부의 패턴(21)을 형성하는 공정,  제 도28c에 도시한 바와 같이 반전패턴(21)을 마스크로 해서 스탬퍼원반(30)을 에칭해서 스탬퍼를 형성하는 공정,  제 도28d에 도시한 바와 같이 포토레지스트 마스크 나머지(패턴21)을 제거하여 스탬퍼(26)으로 하는 공정 및  제 도28e에 도시한 바와 같이 상기 스탬퍼(26)을 사용해서 플라스틱 성형하는 공정으로 이루어진다. The production method (1) the photo-mask having a pattern portion small projections as shown in as shown in Fig. 28a a step of forming on the stamper disk 30, the photoresist 21 is prevented,  the FIG. 28b 22, the step of forming the pattern 21 was irradiated by ultraviolet ray 23 from the top, the developer by little to a stamper disk (30) of the convex portion of the mask 22, and arranged on the stamper disk 30,  the remaining photoresist mask, as shown at a step  the FIG 28d to form a by etching the stamper disk 30, the stamper by a reversal pattern 21 as a mask as shown in Figure 28c ( pattern 21), as shown in the process and removed by  the Figure 28e of the stamper 26 is made of a process of plastic molding using the stamper (26). 본 공정은 도금공정을 사용하지 않고 직접 스탬퍼(26)을 가공하는 점이 제 도27의 공정과 다르다. This step is different from the procedure shown in FIG. 27, point to process the stamper 26 without using a plating process. 여기서, 스탬퍼원반(30)은 예를 들면 Ni 등의 경면 마무리한 금속판이다. Here, the stamper disk 30 is a metal plate, for example a mirror finish, such as Ni. 포토마스크패턴을 마스크로 해서 스탬퍼원반(30)을 에칭하는 방법으로서는 웨트에칭 이외에 각종의 드라이에칭법을 사용할 수 있다. A method for a photomask pattern etching the stamper disc (30) to a mask may be used various dry etching method in addition to wet etching. 그 중에서 반드시 이온빔을 소정의 각도에서 입사시켜서 작은 볼록부(10)의 경사각을 제어할 수 있는 이온밀리온법은 이것에 적합한 방법이다. Among ion mm onbeop that can be joined to thereby control the inclination angle of the small convex portion 10, the ion beam at a predetermined angle is a method suitable for it. 또한, 스탬퍼원반(30) 대신에 일반적으로 사용되는 금형재료를 사용해서 상기 제조법에 의해 직접 금형을 제조할 수도 있다. It is also possible to use mold materials that are commonly used in place of the stamper disc (30) to produce a mold directly by the recipe. 제 도29는 도광판(2)의 제조방법의 또 다른 실시예를 도시한 공정도이다. Claim 29 is a process drawing showing another embodiment of a method of manufacturing a light guide plate (2). 이 제조방법은  제 29도a에 도시한 바와 같이 기판(20)에 포토레지스트(21)막을 형성하는 공정,  제 29도b에 도시한 바와 같이 작은 볼록부의 패턴을 가진 포토마스크(22)를 상기 기판(20)상에 배치하고, 마스크(22)의 위쪽에서 자외선(23)을 조사한 후 현상해서 기판(20)에 작은 볼록부의 패턴의 원형을 형성하는 공정,  제 29도c에 도시한 바와 같이 패턴을 드라이에칭해서 패턴을 원하는 단면형상으로 정형하는 공정,  제 29도d에 도시한 바와 같이 금속도금(24)을 실시하고, 플라스틱성형용 스탬터(26)을 형성하는 공정 및  제 29도e에 도시한 바와 같이 상기 스탬퍼(26)을 사용해서 플라스틱성형하는 공정으로 이루어진다. The production method (1) of claim 29, also the step of forming the photoresist 21 to the substrate 20, a film as shown in a,  29 Fig picture with the pattern portion small projections as shown in b mask 22 a step of arranging on the substrate 20, forming a circle of small convex portions of the pattern on the substrate 20 to the developing was irradiated by ultraviolet rays (23) from the top of the mask 22,  29 also processes that by dry etching a pattern as shown in c shaping the pattern in any cross-section,  the and 29 also carry out the metal plating 24 as shown in d, Stamford for plastic emitter 26 a, as shown in process, and  of claim 29 also comprises a step of e to form plastic molding using the stamper (26). 이 공정은 포토마스크패턴을 드라이에칭법에 의해 소정의 형상으로 성형한 후 도금공정에 의해 스탬퍼(26)을 형성하는 방법이고, 드라이에칭법으로서 이온밀링 등을 사용하는 것에 의해 작은 볼록부 또는 작은 오목부로 이루어지는 도트의 원형을 원하는 단면형상으로 정형할 수 있다는 특징을 갖는다. This step photo mask pattern and method for forming a stamper (26) by a plating process and then forming into a predetermined shape by a dry etching method, a dry etching method, ion milling, etc. to as small projections or small by using It has the feature that the fixed form can be a circular dot in a depression formed in a desired cross-sectional shape. 마지막으로, 액정표시장치의 구성을 설명한다. Finally, a configuration of a liquid crystal display device. 제 30도에 본 발명의 액정표시장치의 모식적 단면도를 도시한다. It shows a schematic cross-sectional view of a liquid crystal display of the present invention of claim 30. 배면조명부로서의 도광판(2)의 상면에는 편향판(31), TFT(32), 액정셀(33), 공통전극(34), 컬러필터(35), 편향판(31)이 설치된다. The upper surface of a rear lighting unit as a light guide plate (2), the deflector (31), TFT (32), the liquid crystal cell 33, a common electrode 34, a color filter 35, a deflector 31 is provided. 이 구성은 액정표시장치의 일반예를 도시한 것으로서, 표시장치의 용도에 따라서는 배면조명부를 포함해서 여러가지의 구성을 고려할 수 있다. This configuration as showing a general example of a liquid crystal display device, in accordance with application of the display device may be considered a variety of configurations including a rear lighting unit. 예를 들면, 퍼스널컴퓨터의 디스크톱형 액정표시장치, 또는 텔레비젼 모니터에는 특히 넓은 시야각이 요구되지만, 이 경우에는 조명광을 산란시켜서 시야각을 확대시키는 확산판을 새로이 제 16도의 적정한 위치에 배치할 수 있다. For example, in the disk tophyeong liquid crystal display device, or a television monitor of the personal computer, especially a wide viewing angle, but the requirements in this case, it is possible to place a diffusion plate to thereby scatter the illumination light expanding the viewing angle newly to claim 16 degrees proper position. 또, 프리즘시트(4)를 배치해서 또 지향성이 높은 조명광을 액정셀(33)에 조사한 후, 시야각을 넓히기 위해 광확산효과가 있는 시트를 배치하거나 광투과면을 가공해서 광산란기능을 갖게 하여 시야각을 넓게 할 수도 있다. Further, to have the prism sheet 4, the disposed again after directivity is irradiated with a high illumination light to the liquid crystal cell 33, a light scattering function to place the sheet with a light diffusing effect, or process the light-transmitting side to widen the viewing angle field of view the can also be wider. 광원의 구체예로서는 냉음극관, 열음극관, 텅스텐램프, 키세논램프, 메탈할로이드램프 등을 들 수 있다. Specific examples of the light source may be a cold cathode tube, heat cathode tube, a tungsten lamp, a key senon lamp, Lloyd lamp or the like to the metal. 통상, 냉음극관과 같은 저온계의 광원이 바람직하다. This type of low-temperature light source such as a conventional, cold-cathode tube is preferred. 본 발명에 사용하는 액정소자 내지는 액정셀에 대해서 특별히 한정은 없고, 공지의 소자, 패널을 사용할 수 있다. With respect to the liquid crystal cell naejineun liquid crystal device used in the present invention it is not particularly limited, it is possible to use the known device the panel. 일반적인 액정셀로서는 트위스트 네마틱형이나 슈퍼 트위스트 네마틱형, 호모지니어스형, 박막트랜지스터형의 것, 또 액티브 매트릭스 구동형이나 단순 매트릭스 구동형의 것 등을 들 수 있다. As typical liquid crystal cell, and the like that of the twisted nematic or super twisted nematic, homogeneous type, thin-film-transistor, and an active matrix driving type or the simple matrix driving type ones. 또한, 필요에 따라서 사용되는 휘도균일화 마스크(도시하지 않음)은 광원으로부터의 거리차에 의한 휘도의 불균일을 보상하기 위한 것으로서, 예를 들면 광의 투과율을 변화시킨 시트 등으로서 형성되는 것이고, 휘도균일화 마스크는 도광판상의 임의의 위치에 배치할 수 있다. In addition, the brightness uniform mask used as necessary (not shown) will be formed as such was changed to, for example, transmittance of light as for compensating for luminance non-uniformity in according to the distance difference from the light source sheet, the brightness uniform mask It may be placed in any position on the light guide plate. 이상 기술한 바와 같이 본 발명의 배면조명부를 액정표시장치에 사용하는 것에 의해 종래 다수의 부품, 즉 광원, 도광판, 확산시트, 프리즘시트, 반사시트 등으로 구성되어 있던 배면조명부의 부품점수를 삭감시킬 수 있다. Above-described prior art a number of parts by using a rear lighting unit of the present invention to a liquid crystal display device as described, that is to cut the rear illumination of the number of components that consists of a light source, a light guide plate, a diffusion sheet, a prism sheet, reflection sheet, etc. can. 동시에 휘도의 향상, 부품가격과 조립공정수의 저감을 도모할 수 있다. At the same time the improvement of the luminance, the part can be reduced in cost and assembly process number. 또, 본 발명에 의하면 종래 장치의 구성에서 문제였던 므와레의 발생이 없어 반사시트와 도광판 사이에 먼지가 혼입하는 것에 의한 광이용효율변화 및 휘도불균일 발생이 없는 안정된 특성을 가진 액정표시장치가 얻어져 공업적 효과는 매우 큰 것이다. Further, according to the present invention is a liquid crystal display device having a light use efficiency variation and stable characteristics with no luminance non-uniformity occurs due to the dust is entrained between the configurations do not have in the generation of moire and Le was the problem, the reflective sheet and the light guide plate of the conventional apparatus is obtained industrially effect is very large. 또, 본 발명의 도광판의 제조방법에 의해 다기능인 도광판을 용이하게 제조할 수 있다. Further, by the manufacturing method of the light guide plate of the present invention it can easily produce a multi-function of the light guide plate. 액정셀, 이 액정셀의 배면에 배치된 도광판 및 이 도광판의 측면에 배치된 광원을 구비한 액정표시장치에 있어서, 상기 도광판은 상기 광원으로부터의 광의 입사면, 입사된 광을 상기 액정셀에 대해서 출사시키는 광투과면 및 상기 입사면으로부터의 광을 상기 광투과면 방향으로 인도하는 여러개의 작은 볼록부 또는 작은 오목부로 이루어지는 반사사면을 갖는 것을 특징으로 하는 액정표시장치. In the liquid crystal cell, the light guide plate and a liquid crystal display device having a light source disposed on a side surface of the light guide plate disposed on the back of the liquid crystal cell, the light guide plate side of light incident from the light source, with respect to the incident light to the liquid crystal cell emitting the light transmitting surface and the liquid crystal display device characterized in that it has a reflecting surface made of the light from the incident surface portion several small projections or small recess leading to the light transmission direction of surface. 제1항에 있어서, 상기 도광판의 반사사면 형성부에 반사막을 실시한 것을 특징으로 하는 액정표시장치. The method of claim 1, wherein the liquid crystal display device, characterized in that subjected to a reflective film on a reflective surface forming part of the light guide panel. 제1항에 있어서, 상기 도광판의 반사사면 형성부에 반사막 및 이 반사막의 보호막을 실시한 것을 특징으로 하는 액정표시장치. The method of claim 1, wherein the liquid crystal display device, characterized in that subjected to a reflective film and a protective film of a reflection film on a reflective surface forming part of the light guide panel. 제1항에 있어서, 상기 도광판의 반사사면 형성부의 반사시트를 배치한 것을 특징으로 하는 액정표시장치. The method of claim 1, wherein the liquid crystal display device, characterized in that the arrangement forming the reflection surface reflection sheet portion of the light guide panel. 제1항에 있어서, 상기 도광판의 반사사면의 한변의 크기 또는 직경의 크기가 10㎛~200㎛의 범위에 있는 것을 특징으로 하는 액정표시장치. The method of claim 1, wherein the liquid crystal display device, characterized in that the size or diameter of the reflection surface of one side of the light guide plate in the range of 10㎛ ~ 200㎛. 제5항에 있어서, 상기 도광판의 반사사면의 한변의 크기 또는 직경의 크기가 10㎛~90㎛에 있는 것을 특징으로 하는 액정표시장치. The method of claim 5, wherein the liquid crystal display device, characterized in that the size or diameter of the reflection surface of one side of the light guide plate in the 10㎛ ~ 90㎛. 제1항에 있어서, 상기 도광판의 반사사면의 형상이 대략 직사각형이고, 그의 짧은 변의 길이가 5㎛~200㎛의 범위에 있는 것을 특징으로 하는 액정표시장치. The method of claim 1, wherein the liquid crystal display device and the shape of the reflection surface of the light guide plate substantially rectangular, whose shorter side characterized in that in the range of 5㎛ ~ 200㎛. 제7항에 있어서, 상기 짧은 변의 길이가 10㎛~100㎛의 범위에 있는 것을 특징으로 하는 액정표시장치. The method of claim 7, wherein the liquid crystal display device, characterized in that the short-side length in the range of 10㎛ ~ 100㎛. 제1항에 있어서, 상기 도광판의 반사사면의 형상이 대략 직사각형이고, 그의 짧은 변과 긴변의 비가 1 : 2~100인 것을 특징으로 하는 액정표시장치. The method of claim 1, wherein the shape of the reflection surface of the light guide plate substantially rectangular, its short side and the long side ratio of 1: Liquid crystal display device, characterized in that 2 to 100. 제1항에 있어서, 상기 도광판의 반사사면의 형상이 대략 직사각형이고, 상기 직사각형의 긴변이 상기 광원에 대해서 대략 평행하게 배치되어 있는 것을 특징으로 하는 액정표시장치. The method of claim 1, wherein the shape of the reflection surface of the light guide plate substantially rectangular liquid crystal display device, characterized in that long sides of the rectangular are disposed substantially parallel with respect to the light source. 제1항에 있어서, 상기 도광판의 반사사면의 단면경사각도가 상기 도광판면에 대해서 35°±15°의 범위에 있는 것을 특징으로 하는 액정표시장치. The method of claim 1, wherein the liquid crystal display device, characterized in that cross-sectional inclination angle of the reflection surface of the light guide plate also is within the range of 35 ° ± 15 ° with respect to the light guide plate side. 제11항에 있어서, 상기 도광판의 반사사면의 단면경사각도가 상기 도광판면에 대해서 35°±10°의 범위에 있는 것을 특징으로 하는 액정표시장치. The method of claim 11, wherein the liquid crystal display device, characterized in that cross-sectional inclination angle of the reflection surface of the light guide plate also is within the range of 35 ° ± 10 ° with respect to the light guide plate side. 제11항에 있어서, 상기 도광판의 상면에 제1 프리즘각 θp1이 80~88°, 제2 프리즘각 θp2가 20~40°인 프리즘시트를 배치한 것을 특징으로 하는 액정표시장치. The method of claim 11, wherein the liquid crystal display device, characterized in that the first prism, each θp1 on an upper surface of the light guide plate is 80 ~ 88 °, the second prism each θp2 the arrangement of the prism sheets 20 ~ 40 °. 제1항에 있어서, 상기 도광판의 반사사면의 단면각도가 상기 광원측에서 이것과 반대측을 향해서 변화하고 있고, 그의 각도가 광원측이 작은 것을 특징으로 하는 액정표시장치. The method of claim 1, wherein the liquid crystal display device and to the cross-sectional angle of the reflection surface of the light guide plate changes toward the side opposite it and from the light source side, whose angle is smaller the light source side. 제1항에 있어서, 상기 도광판의 반사사면의 단면각도가 상기 광원측에서 이것과 반대측을 향해서 변화하고 있고, 그의 크기가 광원측이 큰 것을 특징으로 하는 액정표시장치. The method of claim 1, wherein the cross-sectional angle of the reflection surface of the light guide plate changes toward the side opposite it and from the light source side, the liquid crystal display device, characterized in that the light source whose size is larger side. 제1항에 있어서, 상기 도광판의 반사사면의 높이 또는 깊이가 2㎛~40㎛의 범위에 있는 것을 특징으로 하는 액정표시장치. The method of claim 1, wherein the liquid crystal display device, characterized in that the height or depth of the reflection surface of the light guide plate is within the range from 2㎛ ~ 40㎛. 제1항에 있어서, 상기 도광판의 반사사면이 대략 랜덤하게 배치되어 있는 것을 특징으로 하는 액정표시장치. The method of claim 1, wherein the liquid crystal display device characterized in that the reflection surface of the light guide is arranged substantially at random. 제1항에 있어서, 상기 도광판의 두께가 상기 광원에서 멀어짐에 따라 얇게 형성되어 있는 것을 특징으로 하는 액정표시장치. The method of claim 1, wherein the liquid crystal display device, characterized in that the thickness of the light guide plate is formed to be thinner in accordance with the increasing distance from the light source. 제1항에 있어서, 상기 도광판의 반사사면의 단위면적당의 수가 상기 광원측에서 그의 상대하는 측을 향해서 증가하도록 형성되어 있는 것을 특징으로 하는 액정표시장치. The method of claim 1, wherein the liquid crystal display of the number per unit area of ​​the reflection surface of the light guide plate unit, characterized in that it is formed so as to increase toward the side of his opponent in the light source side. 기판에 포토레지스트막을 형성하는 공정, 상기 기판 위쪽에 반사사면의 배치패턴을 갖는 마스크를 배치하고 이 마스크의 위쪽에서 자외선을 조사한 후 현상하여 상기 기판에 반사사면의 패턴을 형성하는 공정, 상기 패턴상에 금속도금을 실시하고 플라스틱 성형용 금속스탬퍼를 형성하는 공정 및 상기 스템퍼를 사용해서 플라스틱 성형하는 공정을 적어도 갖는 것을 특징으로 하는 액정표시장치용 배면조명부 도광판의 제조방법. And then developed to place the mask having the arrangement pattern of the reflection surface in the process, above the substrate to form photoresist film to a substrate and irradiated with ultraviolet rays from the top of the mask, the step of forming the pattern of the reflection surface to the substrate, the said pattern to carry out metal plating and method for producing the light guide plate of a back illumination for a liquid crystal display device, characterized in that a step of molding a plastic using the process and the stamper to form a metal stamper for forming at least a plastic. 스탬퍼원반에 포토레지스트막을 형성하는 공정, 상기 스탬퍼원반의 위쪽에 반사사면의 배치패턴을 갖는 마스크를 배치하고 이 마스크의 위쪽에서 자외선을 조사한 후 현상해서 상기 스탬퍼원반에 반사사면의 패턴을 형성하는 공정, 상기 패턴을 마스크로 해서 상기 스탬퍼원반을 에칭하고 플라스틱 성형용 금속스탬퍼를 형성하는 공정 및 상기 스탬퍼를 사용해서 플라스틱 성형하는 공정을 적어도 갖는 것을 특징으로 하는 액정표시장치용 배면조명부 도광판의 제조방법. Placing a mask having the arrangement pattern of the reflection surface in the process, the top of the stamper disc is formed photoresist film to the stamper disc, and by phenomenon was irradiated with ultraviolet rays from the top of the mask, the step of forming the pattern of the reflection surface to the stamper disc the manufacturing method of the back illumination light guide plate for a liquid crystal display device, characterized in that to the pattern as a mask, and a step of etching the stamper disc, and the plastic molding by using the process and the stamper to form a metal stamper for plastic forming at least. 기판에 포토레지스트막을 형성하는 공정, 상기 기판의 위쪽에 반사사면의 배치패턴을 갖는 마스크를 배치하고 이 마스크의 위쪽에서 자외선을 조사한 후 현상해서 상기 기판에 반사사면의 패턴을 형성하는 공정, 상기 패턴을 드라이에칭해서 패턴을 정형하는 공정, 상기 패턴에 금속도금을 실시해서 플라스틱 성형용 스탬퍼를 형성하는 공정 및 상기 스템퍼를 사용해서 플라스틱 성형하는 공정을 적어도 갖는 것을 특징으로 하는 액정표시장치용 배면조명부 도광판의 제조방법. By developing after placing a mask having the arrangement pattern of the reflective surface above the step, the substrate for forming photoresist film to a substrate and irradiated with ultraviolet rays from the top of the mask, the step of forming the pattern of the reflection surface on the substrate, the pattern the rear illumination for a liquid crystal display device of the process, characterized in that a step of using the process and the stamper, which by performing a metal plating on the pattern forming the stamper for the plastic molding molded plastic, at least for shaping the pattern by etching Dry the method of the light guide plate.